We are the oldest and largest accounting firm in NWI, serving both businesses and individuals throughout NWI and the Chicagoland area. We offer a full array of tax, accounting and assurance services. 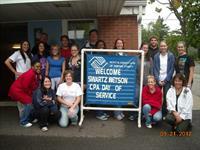 Swartz Retson has helped clients through various changing economies and business environments over the last 80 years. We invite you to visit our website and blog to review our services and professional staff. On Broadway in Merrillville, turn East onto 86th Ave by the tall white Chase building. We are on the right hand side about two blocks down.